Upon completion in summer 2018, the 32,000-square-foot facility, built by Venerable Development, will include modern medical facilities from The Portland Clinic, a new retail concept and nutrition center from the founder of Pacific Foods and educational resources from Concordia University Portland. The four Portland-area-based organizations are working closely together to integrate and increase access to resources that promote a holistic approach to healthy living. When doors to the new building open in 2018, The Portland Clinic will cut the ribbon on a brand-new, 24,000-square foot office space within it. The Portland Clinic Northeast will house major medical services, including behavioral health, dermatology, diabetes services, ear, nose and throat, family medicine, foot and ankle/podiatry, gastroenterology, internal medicine, laboratory services, manual medicine, neurology, physical therapy, primary care and radiology. Clark added that this facility is a key investment for the clinic as it prepares for some other significant updates in the metro area in the coming years. Good health starts with good, nourishing foods, but families don’t always have access or the basic cooking knowledge to help get dinner from pantry to plate. Chuck Eggert, founder of Tualatin-based Pacific Foods and natural foods industry veteran, is aiming to reduce those barriers for clinic patients and local residents with the launch of his new 7,000-square-foot retail concept, basics, set to be showcased on the first floor of the new building. A first of its kind, basics will include space for community education classes on nutrition and meal preparation, serving all ages and catering to the wide variety of dietary challenges facing today’s population. In addition, the store will offer low-priced, high-quality foods including locally-sourced, sustainable meats, basic groceries and meal assembly kits for busy families. Concordia University Portland students are community partners with The Portland Clinic and Pacific Foods. Nursing students at Concordia — one of Oregon’s top-rated, nonprofit, private universities preparing leaders to transform society — have the opportunity to conduct hands-on training through The Portland Clinic facilities. They also provide nutritional counseling at Faubion School as part of 3 to PhD® in collaboration with Pacific Foods. Concordia students will have the opportunity for experiential learning in The Portland Clinic’s new space and will serve as educators in the Pacific Foods classrooms. 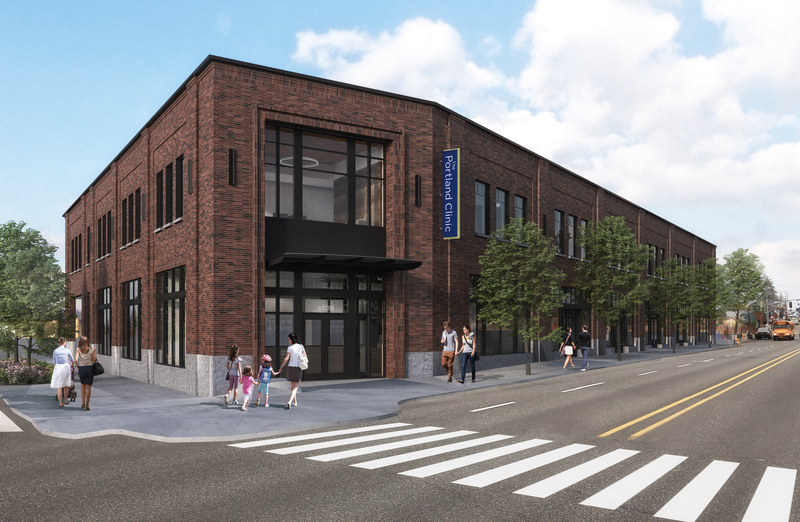 Venerable Properties has a history of supporting and revitalizing spaces that exemplify the culture of Portland, including recent renovations of Washington High School, the White Stag Block and the Telegram Building. Once complete, this new building will emphasize access — offering ample parking and immediate proximity to TriMet — while maintaining the look and feel of the historic Hollywood District. Schommer and Sons, another Portland institution, is the construction contractor for the building which was designed by SERA Architects. Construction will begin immediately and is scheduled to be complete in the summer of 2018. Established in 1921, The Portland Clinic is Oregon’s oldest, private, multispecialty medical group. Today, with sophisticated medical technology, modern spacious facilities and dynamic medical specialists, a personal approach to each patient’s good health remains The Portland Clinic’s primary focus. The Portland Clinic’s six locations serve the greater Portland metropolitan area and care for more than 90,000 patients each year throughout the Northwest. For more information visit www.theportlandclinic.com and follow us on Twitter (@PortlandClinic) and Facebook (@ThePortlandClinic). A new retail concept and nutrition center from the founder of Pacific Foods, basics’ mission is focused on increasing access to nutrition and culinary education, empowering people to make smarter choices about their health and wellness. At nearly 7,000 sq. ft., the store will include dedicated space for nutrition counseling and a full curriculum of cooking classes, as well as healthy meats and basic groceries. Concordia University Portland is a private, Lutheran, liberal arts university located in northeast Portland, Ore. with a mission of preparing leaders for the transformation of society. Founded in 1905, Concordia University serves approximately 5,000 students on its multiple campuses, and online, through its College of Education, College of Health & Human Services, College of Arts & Sciences, School of Management, and Concordia University School of Law in Boise, Idaho. It is pioneering a new national education model 3 to PhD® (www.3toPhD.org). For more visit www.cu-portland.edu and www.concordialaw.com. In business since 1991, Venerable has built a reputation on executing high-quality, community-revitalizing development projects. With a deep background in historic renovation and adaptive reuse, Venerable places that same emphasis on design and durability with their new construction projects. Providing 360-degree real estate services, Venerable also offers commercial and multifamily property management, historic preservation consulting, and brokerage services.